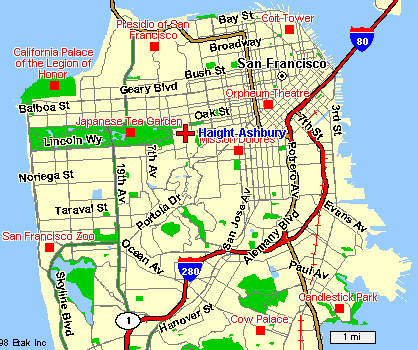 The Haight-Ashbury neighborhood of San Francisco is the home of the flower children, and where I lived for a decade. The sixties didn't actually happen until 1969 and the early seventies, but other than that, your impressions of the Haight are correct. As the locals are fond of saying, "if you remember the sixties you weren't here". During my decade in the Haight I lived on Waller Street. You can see me walking from home to the café (and lots of pictures of me in the café using wireless long before others) in an interview with the Japanese magazine ECIFFO. A detailed accounting of the contents of this weblet is available here.